Gadgets can be fun, convenient, or helpful, but when it comes to your infant, they can also be dramatically relieving and reassuring. What gadgets are more worthy of being invested in than those that keep your children healthy and happy? Constantly having a nervous fit over the safety of your new baby? Find yourself unable to sleep due to false alarms, always rushing to the doctor's office for an opinion, or just constantly in an anxious state of uncertainty? Technology in the USA has advanced in such a way that you can now not only accurately monitor your children's health with no prior training, but also receive expert advice quickly and conveniently from the comfort of your home. Consider protecting your baby's safety and growth with these top gadgets currently offered in the USA. 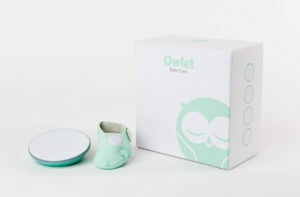 The Owlet Baby Monitor is the perfect gadget for doting parents looking for the best of the best when it comes to monitor technology. It is currently the only USA monitor that uses pulse oximetry, a technology used by hospitals. After over 100,000 hours of testing and two billion recorded infant heart beats, this monitor is ready to give you some peace of mind. With 10x less false alarms than infant movement monitors and even 120x less false alarms than those hospital pulse oximeters the device was based on, the Owlet Baby Monitor might finally give you some sleep. The device comes with three sock sizes so that your baby won't outgrow it too quickly, sock electronics, a base station, corresponding charging cords, and exclusive access to the Owlet app. 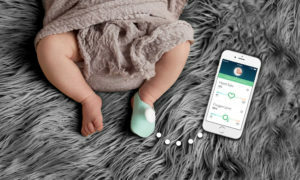 The cute yet surprisingly ultra high tech sock monitors your baby's heart rate and oxygen levels and alerts you if and only if anything seems out of order. The base station assuringly connects directly to the smart sock with no wifi necessarily, but you can also check in from anywhere using your apple device as an added convenience. Why have one set of eyes watching your baby when you can have two? 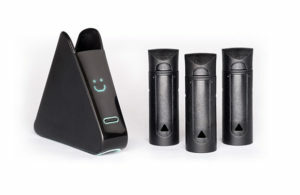 The Nima Sensor is for adults, children, babies...you name it. Nutritious food is important for anyone's health, but is an especially huge priority for your growing infant. Designed in San Francisco by a USA based team from MIT, Stanford, Google, and Nike, this gluten testing device is on the top of its game and will be sure to protect you and your children from unhealthy food. The Nima Sensor is the fastest gluten tester on the USA market, letting you know if there is 20ppm or more of gluten in you or your child's food in just over 2 minutes. All you have to do is take a tiny sample of food, put it in a capsule, screw the lid shut to grind the food, and put the capsule in Nima. The mixture in the capsule reacts with the food and is released to the test strip. Nima then uses sensors to analyze and read the test strip. Finally, results are displayed on the front of Nima either as a happy or sad face, making deciphering results so easy a toddler could do it, and maybe they soon will! The kit comes with 1 Nima device, 3 disposable capsules, 1 micro-usb cable, and 1 carrying pouch so you can be sure to feed yourself and your children only the healthiest of foods no matter where you happen to be. The CliniCloud Medical Kit is a connected medical kit capable of monitoring every fever, chill, cough, wheeze or cold in the comfort of your home. Use the stethoscope to listen and develop informed opinions or the CliniCloud thermometer to take temperature readings quickly and effortlessly. The thermometer requires no skin contact, allowing you to finally take accurate readings without disturbing your little one. 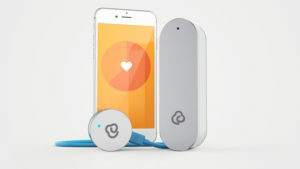 The app integrates recordings from the two devices in addition to recording respiratory and heart rate and storing a timeline of health. Guided check-ups allow you to confidently assess a situation, but if you'd still like a better opinion, you can video chat with a physician and get heart and lung sounds examined in real time. It's like having a doctor's office in your very own home or anywhere you decide to bring the compact and portable kit. The Kinsa Smart Thermometer is an award winning device highly recommended by pediatricians and parents alike. 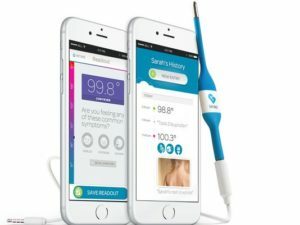 Just plug the Kinsa Smart Thermometer into your headphone jack and launch the app to access 25 ,000x the processing power of a regular digital thermometer. Since it taps into your smartphone for power and uses your screen as a display, Kinsa is also extremely lightweight and durable, withstanding even the most rambunctious of kids. Kinsa truly is a smart thermometer, helping you take an accurate reading and tracking fevers, symptoms, and medications for each family member right on your phone. When a fever and symptoms are cause for serious concern, Kinsa offers real-time medical guidance from top experts directly in the app. The Cellscope Oto is surely the smartest ear care you can purchase for your family. 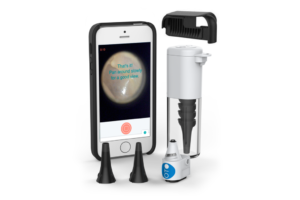 Cellscope Oto is a phone attachment that transforms your phone into a smart device that allows you to see inside your child's ears, making ear infection false alarms a thing of the past. There's no longer a need to rush to the doctor, missing school or work, every time the possibility of a problem arises. Know exactly what to do by looking inside your child's ear yourself with the guidance of the Seymour app and sending captured videos to on-call doctors to get professional advice on what to do next. You may be realizing that these potentially life saving gadgets are not sold in your region, but we have a solution for that. There is nothing more important than the health, happiness, and safety of your child, so why wait any longer to ensure that they grow up being benefited by the best technology the USA has to offer? Big Apple Buddy is a concierge service devoted to bringing the best technology available in the USA to those with no access but just as much need or desire. Learn more about our service or get a free shipping quote for your favorite baby gadget today!